1. I got a new day job / promotion. I was promoted from indie-rock-princess to indie-rock-queen. Hah, no. But I did go from a glorified secretary to being in charge of over 200 of our music client accounts. So, needless to say, I’ve been working 9+ hours a day trying to figure out everything that goes along with this new job. 2. It’s spring! And I’ve been putting most of my free time energy into prepping my garden. What good is a food blogger who can’t even grow her own produce to write recipes with? 3. My grandma passed away. I realize that this is a normal occurrence for people over the age of 80 but that does not make it any less unsettling. I don’t care how old you are – it’s very upsetting to watch a wonderful person have everything ripped away from them. 4. My boyfriend is obsessed with the X-Files. And not only is he obsessed but he is determined to watch EVERY SINGLE EPISODE. So starting at season one in Februaray, he has constantly had that on the TV…which has been…very distracting. Do you know how many episodes of the X-Files there are? HUNDREDS. There are NINE seasons. Do you realize how many hours have been wasting getting sucked in by that when I could have been cleaning my stove-top or seasoning my cast iron or making butterscotch cookies?! 5. Remember that Lemon Thyme Butter I posted about last week? OH MY! I’ve discovered that it’s pretty much amazing on everything. Melt it over pasta or spaetzle and thank me later. You’re welcome. Okay, enough about me. Let’s talk about YOU! I have an ice cream recipe for YOU. Yup, that is right – homemade ice cream. And it’s filled with the most delicious…well I can’t tell you. But it’s sweet and savory and creamy and Middle Eastern. And it’s going to be posted on VV soon…how soon? I can’t tell you that either (can’t ruin the fun now!) – you’ll just have to check back. Now back to ramps. Yes, that is right. I am posting ANOTHER ramps recipes. Two in a row, really? Well if we compare it to how many pizza or tofu recipes I’ve posted then it’s really not that bad. 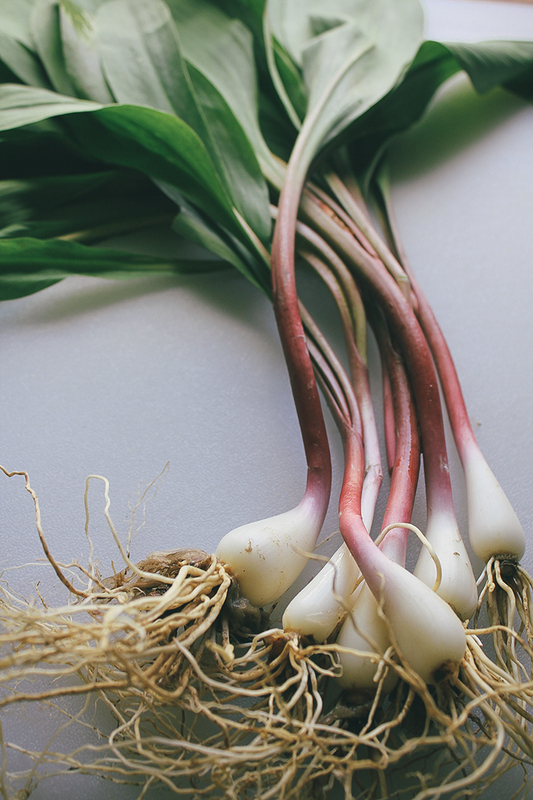 Ramps are new to me…and I’m pretty obsessed. I know they are going to start disappearing from the Farmer’s Market just as quickly as they appeared. This means, I’ve been cooking them up like crazy while I can! To roast the vegetables: Preheat oven to 400 and toss the veggies with olive oil, thyme, salt, and pepper. Lay in a even layer on a baking sheet and roast for 20 minutes or until the vegetables have softened and just started to brown. To make the chimichurri: Rinse the ramps and cut off the roots and any rough tips. Slice into big chunks. Blend all ingredients in a food processor (or blender) until a smooth paste forms. To make the waffles: Preheat your waffle maker. Mix the flour, cornmeal, baking soda, salt, and sugar in a bowl. In another bowl, whisk together the egg yokes, milk, and butter. Fold the dried ingredients into the liquid until incorporated. In another bowl, beat the egg whites with a mixer until stiff but not dry peaks form. Fold the egg whites and grated cheese into the batter. Ladle 1/2 cup (more or less depending on how big your waffle maker is) of the batter onto your preheated waffle iron and cook according to manufacture’s instructions (mine usually takes around 3 minutes). 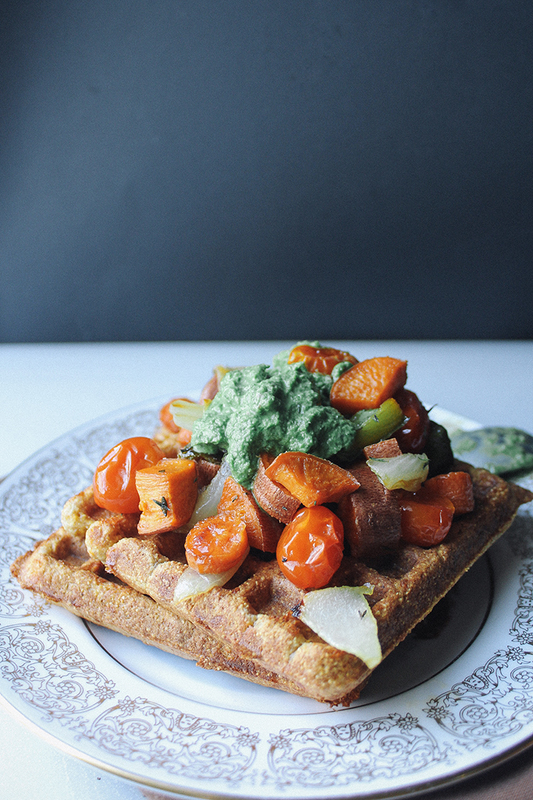 Pile high with roasted veggies and chimichurri. Thank you for the kind words, Carey! 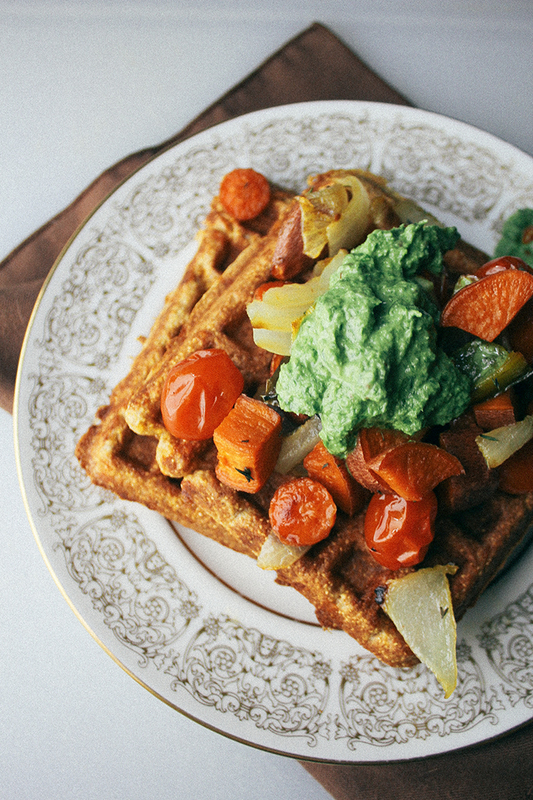 The idea of savory waffles has totally taken my dinners to a new level. 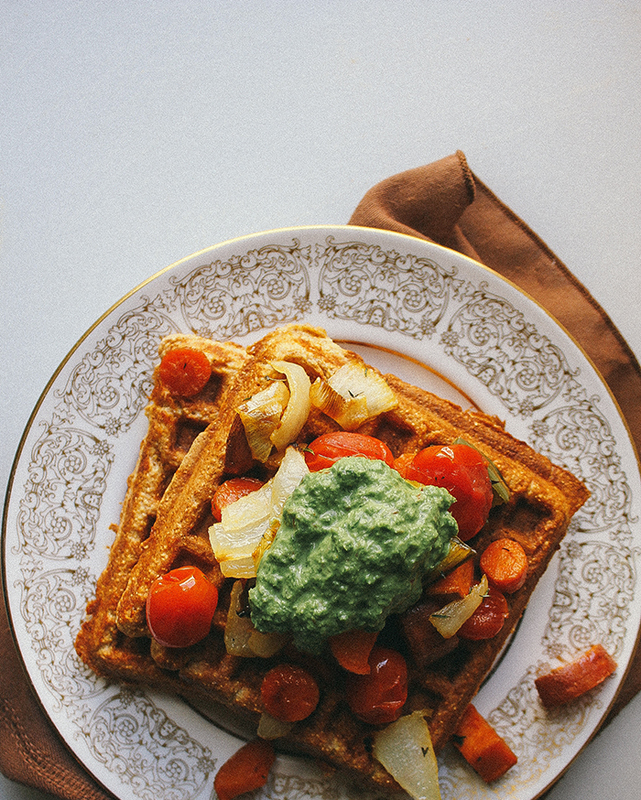 I bet these waffles would be even better with some of your homemade sriracha! 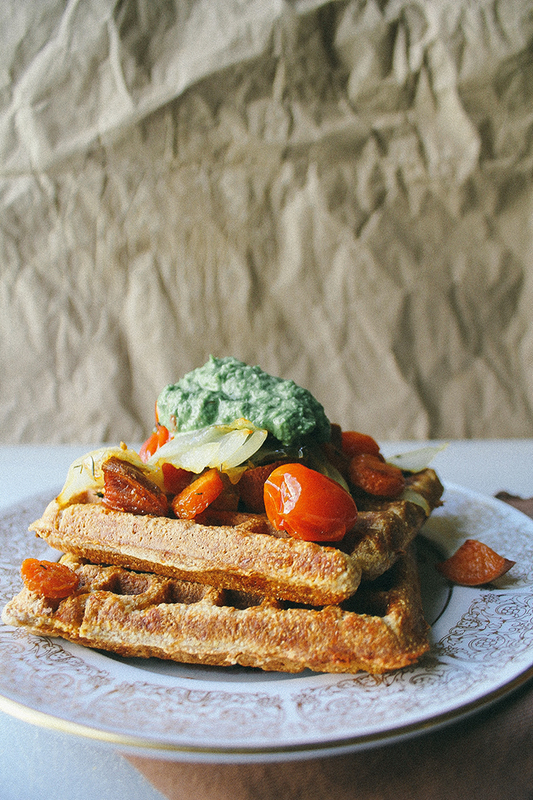 Oh – maybe I’ll have to throw some sriracha in the cheesey waffles next time – next level baking here!